While Botox is commonly used for cosmetic purposes, doctors say the reasoning behind the treatment for depression may not be what you expect. “We don’t believe it has anything to do with looks,” says researcher Dr. Eric Finzi of Chevy Chase Cosmetic Center. Rather, he says it’s because facial expressions are part of the circuit of the brain related to mood. Pharma companies are looking at old drugs — including a common cough suppressant, an opiate addiction treatment, and even Botox — for new ways to treat depression. Despite the dozens of prescription drugs on the market for treating depression, up to half of depressed people can’t find relief. When we are happy, our natural response is to smile. But if you flip that around, does the reverse hold true? When we smile, is our natural response then to be happy? In fact, even faking or forcing a smile reduces stress and makes you happier…. …Another study looked at the effect of facial expression on depression. The experimenters, Eric Finzi (cosmetic dermatologist) and Norman Rosenthal (professor of psychiatry at Georgetown Medical School) worked with 74 subjects who all had major depression, and either gave them a Botox injection between the eyebrows that prevented frowning, or a placebo saline injection that did not affect the facial muscles. 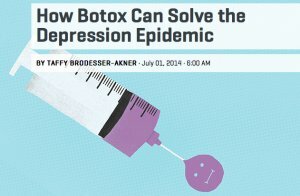 The findings showed that, six weeks after the injection, 52 percent of the non-frowning Botox group showed a reduction in their depression, compared to only a 15 percent improvement rate for the placebo group. The results indicate that putting on a happy face actually makes you happier. It seems that the simple act of a physical smile, authentic or not, tricks your brain into thinking you’re actually happy. Smiling also triggers us to think back to joyful memories, further improving mood. In addition to lifting mood and reducing stress, other research has shown that people who smile are thought to be more friendly and likeable, and smiling actually makes those around you cheerier as well. All of this shows that the old sayings actually deliver great advice — it’s time to turn that frown upside down, grin and bear it, and say cheese! 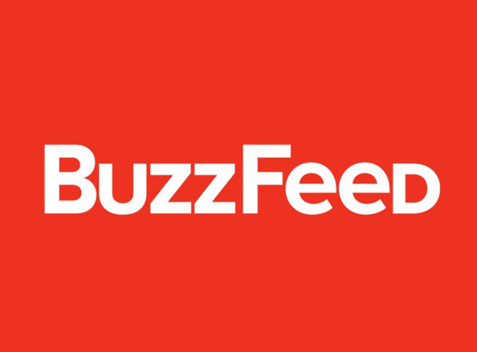 Forbes.com’s Matthew Herper, a reporter on the Pharma and Healthcare beat, covered the recent annual meeting of the American Psychiatric Association in Toronto and wrote about the collective data findings on Botox to treat depression. Herper writes, “the analysis of the data published so far presented here at the American Psychiatric Association in Toronto seem to support the idea that Botox injections in the face can ease depressed mood.” Read more. 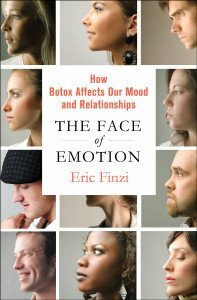 NBC News Today Show correspondent Tom Costello interviews Dr. Eric Finzi and two Botox to treat depression research study participants about the unbelievable treatment for depression. Writer Taffy Brodesser-Akner tries Botox to treat her depression and shares her story with readers of Pacific Standard magazine in the July 2014 issue. MARCH 25, 2014 It may raise a few eyebrows, but a new study suggests Botox, the muscle paralyzing wrinkle tonic, may also be a powerful antidepressant.